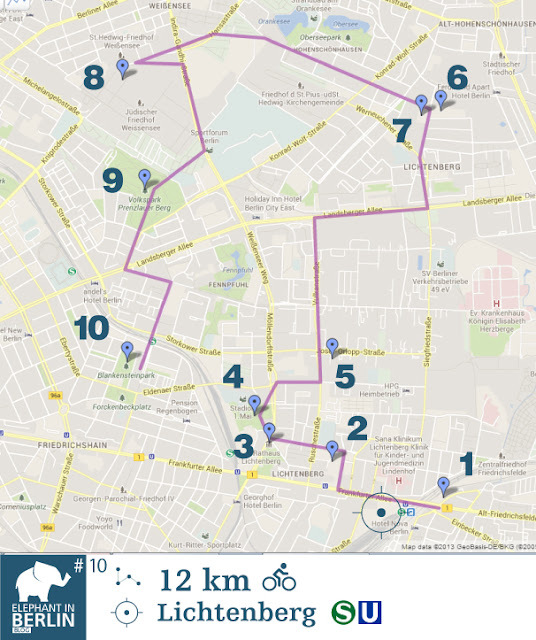 A bike tour through the Stasi district of Lichtenberg, but not only, have a look. Starting from the Lichtenberg Station, you'll find on the other side of the bridge an old big wall murale "Nicaraguanisches Dorf – Monimbó 1978" (1) by Manuel García Moia. Going back on the bridge and entering the district area, you'll find directly the Stasi Museum (2), in which it was headquarter of the STASI (recently reopened), the sicret police of the DDR. Once you've done your tour inside the musuem, you can just go to have a look to the Rathaus (3), well preserved and maybe relax a bit and have a look at the statues in the park (4) just opposite. It is now time to walk a little (better with the bike) to have a look at the Alte Fleischfabrik - Old Meatfactory (5) and the buildings of the Konsumgenossenschaft - Consumer cooperative just on its left. Leading nord and passing by Lansberger Alle you'll arrive to a very strange area, which was not signed on the maps from the East Germany time. This area simply did not exists to its citizens at that time, been a secret area of the Hohenschönhausen - Prison (6), primarily used to house those who wished or attempted to leave the DDR, although political prisons were also held there. Just in front of the Prison, there are the buildings of the Operativ-Technische Sektor (OTS) (7). The departments main task was the production of special intelligence technology and was responsible for the development, production and maintenance of every kind of espionage equipment including secret wiretapping devices, cameras, camouflage and monitoring instruments. If you have still energies, you can bike a bit more to the Jewish cemetery - Jüdischer Friedhof (8), which is the second largest Jewish cemetery in Europe, with approximately 115,000 graves. It was dedicated in 1880. Or maybe you can have some time for yourself at the Weisser See, the small round lake with its bathing beach. Leading south you'll find the Volkspark Prenzlauer Berg (9), less famous as the Volkspark Friedrichshain, but nice as well. Last milestone of this very long trip is the The Long Sorrow: Alter Schlachthof - Slaughterhouse (10), a really huge area which was the central stockyard and slaughterhouse of Berlin, from where you can also take the S-bahn at Storkower Straße.